and does not interrupt water flow. Line pressure powered, no external power required. PLC, electrical and battery operated controls. Automatic self cleaning with no loss of flow. Single units, with 2″ to 16″ flanges which handle flowrates of 10-15,000 gpm. Pressures to 150 psi; Temperatures to 150° F; 30 psi minimum inlet pressure. Flat stainless steel screens down to 50 micron. 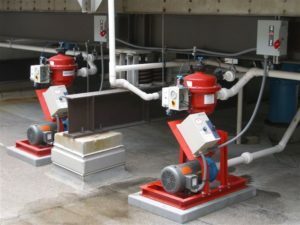 Units with automatic built-in relief bypass. Operate in any position, even upside down.